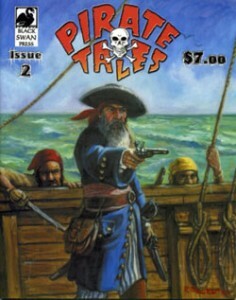 The world of pirate comicbooks has been precarious at best. As soon as a new title enters the market – be it good or bad – it quite often fades into oblivian before you can even give it a fair chance. Not so with “Bloodthirsty Pirate Tales,” a historically-based comic book series that primarily traces the exploits of Blackbeard. “Bloodthirsty Pirate Tales” managed to stay alive for a full eight years – virtually an eternity for the pirate comic genre. And even though they only managed an average of one comic per year, they nontheless left a fine legacy, and are surely remembered fondly by many a pirate enthusiast. But geez, I’m talking about them as if they were dead. “Pirate Tales” is the new incarnation of “Bloodthirsty Pirate Tales” – differing from its predecessor primarily in that it traces the whole history of pirates, rather than following the career of only Blackbeard. Not a chronalogical account, “Pirate Tales” brings numerous snippets together – issue #2 features a quick story about Howell Davis followed by a brief essay on Lady Ching. After that is another tale, this time featureing Captain Daniel, “The Pius Pirate,” and then an evolutionary piece on the development of the galleon. Deeply entertaining and educational, this issue also covers topics on Port Royal, pirates as featured in trade paperbacks, Chinese junks, Captain Shelgrave, and pirate punishments. Each issue of “Pirate” Tales is an extra-large sized comic with a glorious, full-color cover. The artwork inside is black&white, and varies widely in style from one story to the next (although all of it is quite good.) The comic as a whole reminds me of the pulp-style comics such as the old House of Mystery, where the series followed a theme rather than individual characters, bouncing from tale to tale, and throwing in trivia and legends between stories. Pirate Tales is great fun. It’s a bit pricier than most comics, but worth every penny. This entry was posted in Books and tagged becker, non-fiction, pirate art by Bilgemunky. Bookmark the permalink.